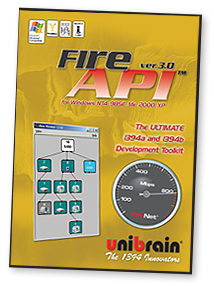 Diagnostic tools: FireViewer, FireCommander, Fire-i IIDC, ubTweak. Three (3) months free development support. Windows XP/Vista/7/8 & Server 2008R2/2012, 32 bit & 64 bit editions. Unibrain or any third party 1394a or 1394b OHCI PCI/PCI Express or ExpressCard compliant adapter, or any Desktop/Portable PC with built-in 1394a or 1394b OHCI support.